Skin Color: Tanned, from time spend outdoors. Emerald eyes, set upon a tan face. 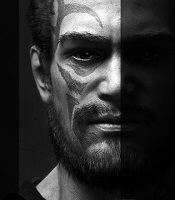 It is often remarked that it is his eyes that is the first thing people notice of Hauk, both due to their deep color but also due to the contrast with the rest of his appearance. A sun kissed face framed by medium length dark brown hair, and a jawline dominated by a shadow that threatens to become a full beard, his eyes are a burst of color in what would otherwise be a man content to be various shades of tan and brown. Hauk is a tall man, and perhaps not sriking as an imposing figure as the mighty Akalaks, he is nonetheless well built, with broader shoulders and a figure toned from his chosen life and that which came before. He often can be found wearing his favorite burgandy shirt, open at the collar along with his trousers and boots, and usually wearing some combination of his leather armor. He carries with him two daggers with him at all times, and if out doors, will always have with him his bow. Hauk is a patient man. One has to be if they are to be a successful hunter. while perhaps not as stoic as he thinks himself to be, he is nonetheless somewhat more reserved. He much prefers being outdoors and surrounded by wilderness than city life, where one becomes nothing more than another citizen, confined to his or her small corner of the world, content with never leaving it. He is not however, a recluse. He does enjoy the company of others, whether it be over a hearty meal, a cup of ale, or a warm fire. He simply is just as comfortable being on his own in the woods as he is in a crowded tavern. Life and Death They are no more than the natural cycle that all life undergoes. Prey are hunted and killed by predators, who in turn lose their own life to other creatures or the natural passage of life. One feeds the other. It is needless death that Hauk is against. ReligionBeing a former member of the Syliran Order, Hauk does have a sense of religion. The patron gods of the order never did quite appeal to him however. Instead he worships Caiyha, who rules over nature and life within it. Magic Hauk is a strong believer in hard work done yourself, and has a slight negative view on those that choose what are in his eyes to be the easy routes. Magic falls in this realm, as a consequence of his ignorance of its nuances. That is not to say he wholly disagrees with it or its use; he definitely understands that Magic can indeed be useful. Law Laws, and the natural extension of them, civilization, are necessary to maintain order in a world that knows chaos. Hauk understands this, perhaps better than most. however there is a limit to the good that they provide. Becoming restrictive, Civilization has the danger of limiting and confining its inhabitants, and in the name of order, would attempt to subjugate ever increasing swaths of land and peoples. The world is natural. The forests, lakes and rivers, and life within them were first before civilization. Hauk Tarn was born in Syliras to two farmworkers. While the Tarn family had roof over their head and food on their table, life was tight in the overcrowded city. Some of Hauks earliest memories are of running through dark corridors of the citadel city, weaving past crowds and patrols of knights. While the family lived within an acceptable standard of living, there was not often enough money to provide for more than the necessities. As a result, once he was old enough, Hauk made to join the knights of Sylir, hoping in part to raise his family and also to escape the suffocation that city life imposed. As a squire of the Knights, Hauk took on the responsibilities and duties that were expected of him, and underwent training in the arts of war and knighthood. It was during this time that he found his talent and affinity for the bow. However he never was able to shake the feeling of uneasiness that he felt; the machine that was the order and the city continued to grind on, and those that he had sworn to protect seemed content amongst the stifling air. while he did not know it then, he was not long for the order. When the break finally did happen, Hauk turned in his positions and his standings, bought a horse, and turned towards the wilderness, where he now makes his life as a hunter, content in the freedom he finds in the winds. Cuirass Made from leather, protects the chest, back shoulders and upper arms. Tasset Made from leather. Protects the thighs. Vambraces Made from leather. This protects the forearms. Greaves Made from leather. This protects the shins. composite shortbow, quiver & Arrows Made from laminated horn, wood or bone and built with a recurve, meaning that the bow remains bow-shaped even when unstrung. Able to fly farther and with more impact than a regular shortbow. It has a draw weight of 40lbs, 20 standard arrows, 20 game arrows. Hand and Half Sword Hand and half swords are typical long swords with slightly longer hilts, allowing the wielder to switch between one handed and two handed handling of the weapon. This particular sword is an heirloom that has been passed down from Balians grandfather. Archers Arm guard Made from leather covering most of or the entire forearm of the archer. Protects their skin from the bowstring. Archers Glove A fitted leather glove to protect the fingers from the bowstring. Normally there are only two or three finger pockets, since only the fingers that pull back the string need padded. Tinder Used to start a fire. Backpack used for storage and transportation during travels. Torch A torch for lighting. Tent A simple 1 person tent to shelter one from the elements. Pouch, Belt (x2) A simple belt pouch used to carry supplies. Hunting knife Knife used for the purposes relating to hunting, such as skinning. could also be used as a weapon. Water Skin to store and drink water when on the move. Simple Lantern A simple lantern used to light up the night. Hunting Horn A horn with a distinct low yet clear sound . Bedroll to get some shut eye. Soap for cleaning and shaving purposes. Flint & Steel Struck together to produce sparks, lighting a fire. Rations approximately a weeks worth. wooden comb for attempts to control hair. Travelers Stock an almost black paste made of the highly concentrated renderings of various animals and grains. The stock can make an excellent and hearty soup assuming that you can get a fire going and have clean water to boil it in. When bought the stock has enough material to make 10 days’ worth of soup. Last edited by Hauk Tarn on October 2nd, 2018, 1:39 am, edited 2 times in total.